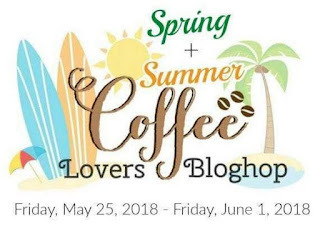 It is that time again for the Coffee Lovers Blog Hop!! Looking forward to seeing some amazing creativity using coffee and tea stamps. This was a fun card to make. 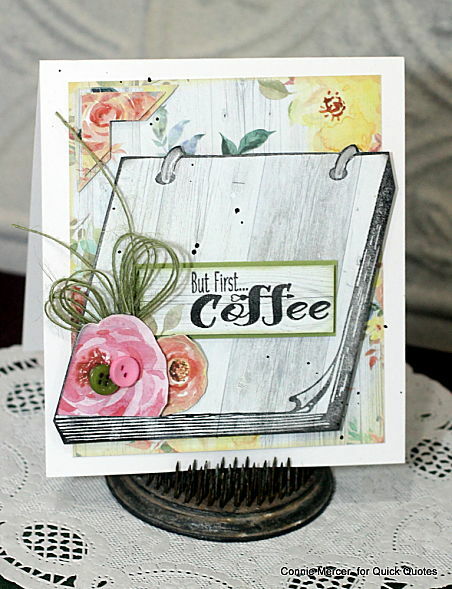 I was very eager to use the new Wendy Vecchi / Note Pad stamp and the Coffee Quotes stamps by Joy Clair. They look great!! 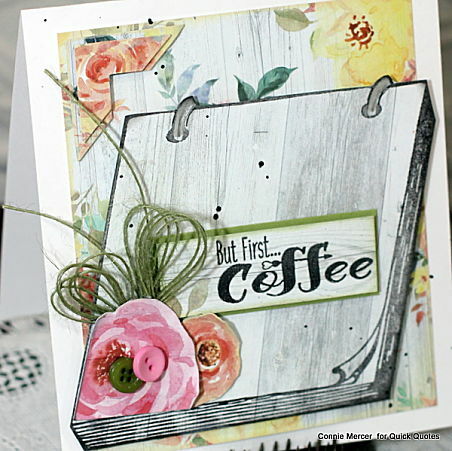 My inspiration was ~wait coffee first, then start on my list to do. The pretty paper is by Quick Quotes. I used Quick Quotes PowderPuff Chalk inks to shade the inside mat of the card. I absolutely LOVE how you tucked in the Olive Burlap String on this one, Connie. It's fabulous! What a PRETTY card, love that stamp and the gorgeous floral print. Very beautiful. I love the flowers. Love love love love this! LOVING how it looks like it's coming right off the paper!!!!!!! beautiful! Love that paper and what a cool stamp! Stunning card! I love that stamp! Wow! What a stunning card! Love it!!! You got really good dimension on this pieced together card--wow! It's so springtime!